The Serbs are a southern Slavic people who received strong cultural influence from the Ottoman Turks. They came from the coast of the Black Sea to the Balkans and north of the Danube River between Dniepar and the northeast Carpathian Mountains. The Kingdom of Serbs, Croats and Slovenes was formed in 1918 and its name was changed to Yugoslavia in 1929. The unraveling of Yugoslavia in the early 1990s resulted in the formation of the Independent Republics of Slovenia, Croatia and Macedonia in 1991. Bosnia-Hercegovina was formed in 1992, while Serbia and Montenegro remained as the new Federal Republic of Yugoslavia. Its leader, Slobodan Milsosevic tried to unite the neighboring republics into a "Greater Serbia" but this effort failed, and Milosevic was ousted by his own people in October 2000. Other peacekeepers were arrested and tried for crimes against humanity. 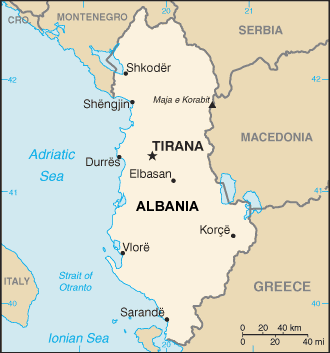 The two latter republics formed a loose union in 2002, called Serbia and Montenegro. Many Montenegrins regard themselves as Serbs, but others insist that Montenegrin is a separate ethnic identity. Until the 19th century, virtually all Serbs were peasants and lived with extended families in villages. Nowadays, most Serbs live in cities and have well developed local government. The Serbs are a still a highly family-oriented society. They have a rich vocabulary for family relationships, even up to the 15th level of the genealogical tree. Their folk attire varies due to very diverse geography and climate of the territory they inhabit. A traditional shoe called opanak is recognizable by its tips that spiral backward. The traditional hat called sajkaca is recognizable by its top part that looks like the letter V or like the bottom of a boat, and is still worn by some villagers today. Customs that surround Serbian weddings are still observed, including a circle dance called kolo, where dancers hold each other by the hands or around the waist, dancing in a circle. The Serbs believe this dance symbolizes the sun. Serbs have their own customs regarding Christmas. These are not associated so much with presents, as in the West, but in special foods and rituals. On Christmas Eve morning, the head of the family goes into the forest to cut a young oak tree, which is to be brought into the church to be blessed by the priest. The oak tree is stripped of its branches, and combined with wheat and other grains, is burned in the fireplace (considered a sacrifice to the gods so the coming year would produce much food, happiness, love, luck, and riches). For city dwellers the church now provides the oak branches and grains. A traditional Serb Christmas custom is to cover the floors of homes and churches with hay, reminding the family of the stable where Jesus Christ was born. Christmas day is celebrated with a feast, featuring a roasted piglet as the main meal. Sweet cakes made of wheat, called koljivo are consumed as a ritual. Cesnica, a special kind of bread, contains a coin, and the one who finds the coin when the bread is broken at lunch believes that he or she will have an especially happy year. Gifts are given to family and friends on Saint Nicholas Day. Most Serbs are non-religious or Orthodox Christians who follow the Serbian Orthodox Church. Thus a change from one religion to the other implies a change of ethnicity as well. The Serbs converted from traditional Slavic beliefs in several waves between the seventh and ninth centuries. Some folkloric and traditional beliefs persist to this day, such as belief in fairies, witches, and vampires. Food and drink are offered to the dead on certain feast days. Of all the Slavs and Orthodox Christians, only Serbs have the custom of Slava, or the celebration of the patron saint of the family, their personal protector. A slava is inherited from father to son, and each household may only have one (there are about 150 patron saints). This means that the occasion brings all of the family together for three days of celebration, ritual dishes, folk oratory, and singing. Guilds are formed by families having the same patron saint. Although many Serbs have heard the name of God, they have become disillusioned with religion. * Ask the Lord to help Serb Christians and church planters to use holidays like Christmas to share the story of Jesus and His love for Serbs. * Pray that Serbs would become dissatisfied with religiosity and would instead seek a relationship with their Savior, Jesus Christ.View Serb in all countries.